Why should I use Dermal Fillers? As we age the natural Collagen and Hyaluronic acid in our skin, which provides the skin with volume and structure, starts to decrease. This, combined with other factors such as sun , smoking and stress, contribute to dry skin and an increased chance of deep lines and wrinkles. Dermal Fillers provide an aesthetic solution for treating these moderate to deep wrinkles. It can also be used to treat deep facial furrows, scars and for increasing the volume to cheeks/ chins and for lip enhancement. Dermal Fillers, once injected, work with you body’s own hyaluronic acid to create volume. Dermal Fillers are an injectable gel that varies in thickness depending on the area being treated. It is injected below the skins surface to fill in or plump up the wrinkles or folds present. 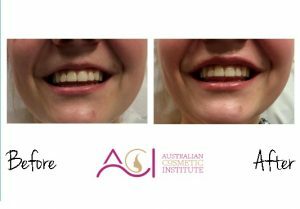 Thus Enhancing lip contours and adding definition and volume to areas of deficit. This procedure is non-surgical and the filler is administered through a series of tiny injections by a trained professional. Local anaesthetic, ice or numbing cream may be administered to help numb the area being treated. The treatment usually takes about 20 minutes and results are seen immediately. Side effects are usually injection-related and temporary, such as swelling, redness, and tenderness at the site. The majority of people return to work or their normal activities immediately following the procedure. The results will last for between 6 months to 5 years, depending on the product used as well as skin type, expectations, and area to be treated.